Solving equations with a variable on both sides proves to be exceedingly tricky for many students. My approach is to focus on the individual expressions taken from both sides of the equation and to present them in the context of a relevant real life situation. The photo shows a snippet of the handout I use. 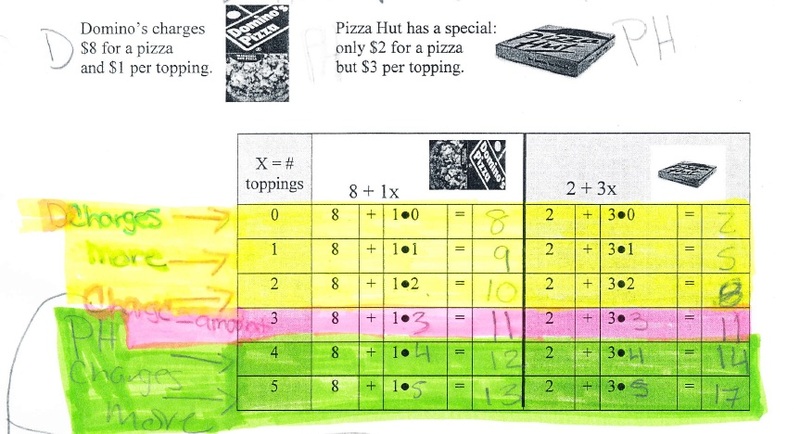 The table is scaffolded to help students compute costs based on number of toppings. The pizza places charge the same at 3 toppings. Domino’s charges more for 0-2 toppings and Pizza Hut charges more for 4 or more toppings. The color coding fleshes this out. Overall the kids are actively engaged and the variable, expressions and the overall equation has meaning.